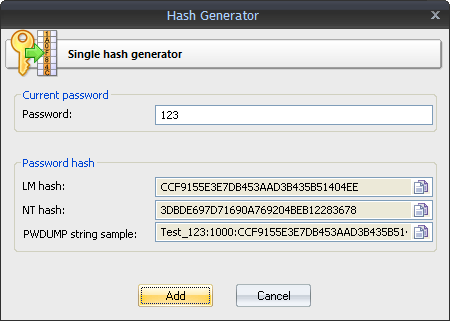 The single-hash generator allows to quickly generate a test entry for a specified password and add it to the hash list. 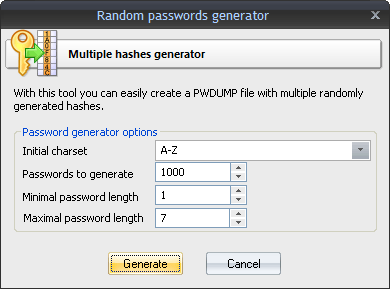 If you want to create a PWDUMP file with a specific number of randomly generated passwords, use the multiple-hash generator. In the new hash dialog, select the minimum and maximum length, character range and the total number of the hashes to be generated. 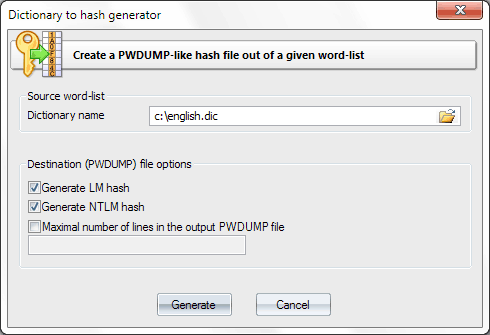 With the dictionary-to-hash generator, you can easily create PWDUMP file out of a given word-list. This tool has a number of additional options here. For example, you can limit the number of output hash items or create PWDUMP file for NTLM hashes only.